Ask a person from the East or West Coast what they know about Minnesota, and the response will most likely be one of these three: First, it is very cold there; second, they have 10,000 lakes (knowledge almost certainly garnered from the state license plates); third, that's where television's Walsh family lived before they moved to Beverly Hills, 90210. The third response is the most probable. What you must then tell that person, after you have sorted out where they stand on the East Coast/West Coast rap war, and whether they think it was Tupac's fault or Biggie's, is that Minnesota is a fascinating place. You could start with a description of the stunning natural landscape, which in truth includes 11,842 lakes – 201 of which are named Mud Lake, continuing the American tradition of flaunting our inability to be creative, as witnessed by the stunning number of cities named Springfield and streets named Elm throughout this wide land – and 6,564 rivers and streams, which roll through verdant farmland and golden pastures in the western and southern parts of the state, under evergreen forests in the north, and through the hardwood or "Big Woods" forests in the East, the same forests that spread across Canada and New England. Yes, you could describe the immense and breathtaking natural beauty of this great state. But who wants to hear about that? We all know what people want when hearing of a new and different land: good trivia. Minnesota is a beautiful land for trivia, with more than enough to fill any number of empty silences at cocktail parties and awkward first dates. Surely the place to start is this: the world's largest ball of twine made by a single person rests in Darwin, Minnesota. Consider the ice broken. 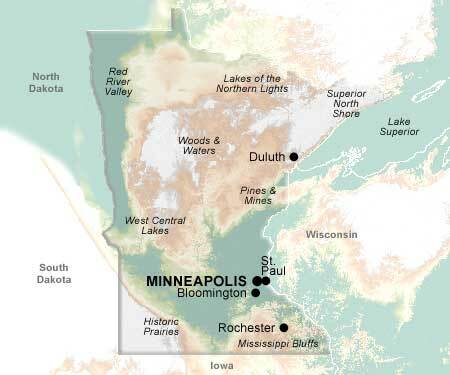 But if your conversation still lacks something to sink your teeth into, here are a few more salted peanuts of Minnesotiana: Minnesota has 90,000 miles of shoreline (This may only be used if it is followed by the qualifier, "More than California, Florida, and Hawaii combined!"). Madison, Minnesota is the lutefisk capital of the United States. Not only does Minnesota lay claim to the country's first enclosed climate-controlled mall, Southdale Mall in Edina, but also to the humbly titled Mall of America, the nation's largest mall (As a sub-category, the MOA also contains the largest indoor theme park, both the first full-service post office and the first accredited university to be in a mall, a wedding chapel, a 1.2 million gallon walk-through aquarium, and 12,550 parking spaces). Also in the World's Largest category for Minnesota are the world's largest pelican (alas, only a statue), the world's largest Paul Bunyan statue, and the world's largest open-pit mine. Minnesota boasts the two northernmost cities to host a baseball World Series, as well as the only facility to host a World Series, a Super Bowl, and an NCAA Final Four. Minnesota is the birthplace not only of Tonka trucks, which are made in Minnetonka (Pause for a response of, "So that's where the name came from! "), but also of scotch tape, the stapler, Wheaties, the bundt pan, HMO's, snowmobiles, waterskis, and the pop-up toaster. And for a final slice of trivial ecstasy: the Hormel company was founded in Austin, Minnesota, which means that Minnesota is the fountainhead of spam. Lest any partisans of Minnesota fret that we at Online Highways are making light of Minnesota's accomplishments, we will close simply, with these last pieces of information: the Mayo Clinic is in Minnesota. The University of Minnesota medical facility is the site of the first artificial blood transfusion, the first use of the "deep-freezing" technique for open-heart surgery, the first open-heart surgery, and the first bone marrow transplant. Minnesota is a beautiful place: it is a place of life.